Earthquake Prediction: Who are the men who say they can predict earthquakes? Who are the men who say they can predict earthquakes? 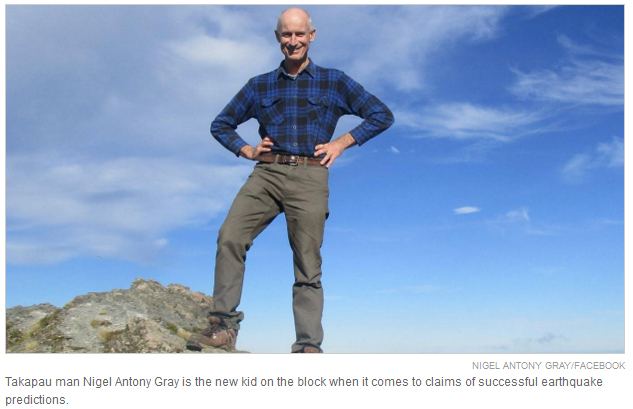 Takapau man Nigel Antony Gray is the new kid on the block when it comes to claims of successful earthquake predictions. The world's top seismologists are yet to figure out how to predict earthquakes but a couple of Kiwi amateurs reckon they've cracked the code. 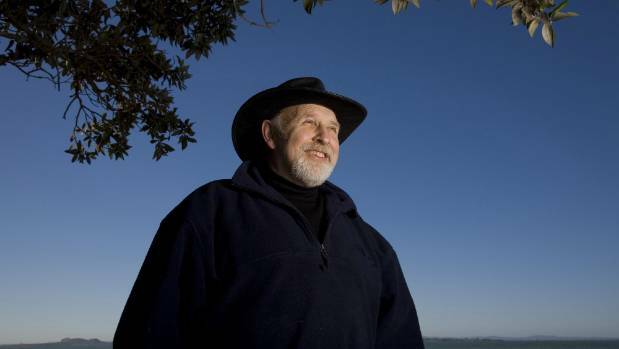 Ken "Moon man" Ring is well known in New Zealand, with his wide-brimmed hat and moon-related earthquake predictions. Now Takapau man Nigel Gray is giving Ring some competition. "Moon man" Ken Ring has been claiming he can predict earthquakes for years but he recently took a step out of the limelight and isn't doing any media interviews. So who are these men who claim to do what the world's top scientists cannot? On November 6, 2016, Nigel Antony Gray posted a "heads up" about a major earthquake on his Facebook page. It said: "On 14th November and a couple of days either side of that date, watch for a major earthquake, and quite possible in South pacific area." At that point, Gray was a little-heard-of painter and decorator from Takapau in Hawke's Bay. The 55-year-old claimed the supermoon made a large earthquake a possibility. "This is just a possibility, but be alert, that is all I am saying." When the November 14 quake struck Kaikoura, Gray shot to notoriety. His so-called prediction was picked up by international media, including the Daily Mail, the Sun and the Mirror in the UK. Gray went from about 600 followers on his Weather Modification Facebook page before the quake, to more than 6000. He now has about 30,000 followers on the renamed Spiritual Awareness New Zealand. However, experts say Gray's November 14 prediction wasn't really a prediction. GeoNet seismologist John Ristau said large earthquakes regularly struck in the South Pacific. In order to predict an earthquake, the person needed to give the date, the location (more specific than South Pacific), and a magnitude, he said. Gray caused another stir by predicting a shake would hit on or about December 13. Gray cited the full moon and Prime Minister John Key's abrupt resignation as justification, and suggested the shake could hit the east coast of the North Island. While most shrugged off the December 13 prediction, and wrote the November 14 forecast off as good luck, some took the prediction seriously and got to work stocking up. On December 12, petrol stations, especially those in Gisborne, were brimming with customers who were worried the big one would hit. At the time, Gray told media his intention wasn't to scaremonger. He said he was just trying to prepare people for the earthquake he believed would strike. While Gray has become a popular character among those who favour alternative theories, he doesn't have any qualifications in the field of seismology, or related scientific fields. He is a painter decorator, who is an owner and director of two businesses - Quality Painters Company and Prosperity Acquisitions, according to Companies Office records. He says his career as a painter makes him qualified to comment on weather, earthquakes and geo-engineering (we'll get to this soon). "As a Painting Trade Contractor I have spent several years checking the weather reports, almost daily, on a need-to-know basis," Gray wrote in an online post. A scroll through his Spiritual Awareness social media page is almost like a session of staring up at the clouds. Pictures of blue sky and what Gray and his followers refer to as chemtrails are peppered throughout his Facebook feed. Gray first stumbled into the world of earthquake predictions via his interest in geo-engineering and weather modification. He claims the New Zealand Government is not only controlling our weather (using chemtrails and chembombs) but also creating earthquakes using a microwave transmission installation called HAARP (High Frequency Active Auroral Research Program). GeoNet's Ristau said it was impossible for man to create a quake like that experienced on November 14. There had been examples of very small quakes being caused by fracking in the United States but the government had no means of creating a significant quake. To put things into perspective: The Kaikoura quake released 2600 times as much energy as every nuclear weapon ever detonated. "There's actually no way humans could set off earthquakes like that," Ristau said. On December 1, Gray submitted an Official Information Act request to the Ministry of Defence: "I would like to know if you have attempted to investigate warfare or terrorism being conducted on New Zealand by means of geo-engineering (creating earthquakes) or weather modification?" He went on to say he had "strong evidence" to suggest the Kaikoura earthquake was "deliberately caused" and there was a plan to create another devastating earthquake using "electromagnetic frequencies" off the East Coast and Cook Strait. The Secretary of Defence, Helene Quilter, responded with a brief letter saying the ministry did not hold any information about supposed geo-engineering, weather modification or man-made earthquakes and had no reason to believe the information requested was held by any other government organisation. NZ Skeptics chairman Mark Honeychurch said Gray appeared to have been interested in conspiracy theories for several years now. "The level of evidence he seems to require in order to accept an idea is very low." On his personal Facebook pages he had posted articles about conspiracies ranging from topics such as chemtrails (spraying of chemicals from commercial airliners), fluoride, 1080 and glyphosate, through to "wacky ideas" such as the moon landings being faked and Michelle Obama being born a man, Honeychurch said. "Unfortunately Gray believes in so many different ideas that are not only far fetched but at times also contradict each other, it's hard to work out how the dots connect." While Gray's painting business appears to be his main source of income, he also offers services as a "life improvement consultant". The techniques Gray used in his life improvement seminars are based on Scientology. He has been advertising his seminars, along with other Scientology-related events and programmes, to his 30,000 Facebook followers. Gary's posted pictures of himself online, and on his consultancy website, with a bookcase full of scientology materials, worth thousands of dollars. He also uses his Spiritual Awareness Facebook page to plug a fuel saving product he sells in New Zealand, called Clean Turbo. Gray did not respond to requests for comment. Instead he posted on Facebook as to why he would not be interviewed by mainstream media. While Gray may be the newest kid on the block, he's not the first Kiwi to claim he can predict earthquakes. Ring has been a well-known fixture in New Zealand for some time now, and also flew to fame off the back of disaster. Ring claims he predicted the Christchurch 2011 quake. He then predicted another big quake would strike on March 20. Thousands of people fled the city in fear. During a TV interview about his predictions, broadcaster John Campbell yelled at Ring. Campbell said he believed Ring was causing unnecessary fear, when the people of Christchurch had been through enough. Before he was a self-appointed weather forecaster and earthquake predictor, Ring was a maths teacher and later became an educational magician, known as Mathman. His Wikipedia page says he was also a musician, actor, clown, speech therapist, private tutor to children with learning difficulties, teacher of English as a second language, part-time teacher's college lecturer, and co-author of a book about reading cats' paws (he said this one was a joke). If you're wondering, the book's called Pawmistry and can be purchased on Amazon for 1 cent. Ring lives in the West Auckland suburb of Titirangi and makes his money forecasting the weather. Unlike traditional meteorological services, Ring claims to be able to predict the weather years in advance (rather than the standard three-day window where a weather forecast is considered likely to be accurate). Ring produces annual weather almanacs for New Zealand, Australia and Ireland through his business Predict Weather. He says he is able to predict the weather based on the trends and cycles of moon orbits. Ring has backed out of the limelight in recent times and did not respond to requests for an interview. According to his Facebook page, Ring has been unwell recently and is taking some time off. Science writer and former NZ Skeptics chair Vicki Hyde said Ring's background was quite common for someone who claimed to be able to predict future events based on trends or patterns they believe others have missed. Hyde said Ring made general predictions and waited until an event happened then drew a target around it. It was not unusual to see people like Ring or Gray come out of the woodwork when an event like the Christchurch or Kaikoura earthquake happened. The problem came when their predictions provoked fear, Hyde said. "There are repercussions for shouting 'fire' in a crowded cinema." Ristau said in his opinion there was "no credibility" in linking moon or lunar phases to earthquakes. People who claim to be able to predict earthquakes are not unique to New Zealand. US-based Dutchsinse - real name Michael Yuri Janitch - says he has created a formula to predict the location and magnitude of earthquakes. The Missouri man now has 185,000 subscribers to his YouTube channel, as well as multiple Facebook pages and a website dedicated to his predictions. He is also a cat lover. ​Honeychurch said the strength of any ability to predict future events was repeatability. "Occasionally people will get lucky with a single prediction, but if someone can reliably and accurately predict future events then there's a chance they're onto something," he said. "For anyone who thinks they can predict earthquakes, I would suggest that they start by making a set of definite predictions (rather than badly worded ones that are easy to fit to many different events) and entrusting them to a third party... These predictions would not be released to the public, to avoid scaremongering. "Once a series of five or ten predictions have proved to have been accurate, with no failed predictions, only then would we recommend that the person goes public with their ability." Ristau said it took a lot of training and experience to understand earthquakes. Even the world's top seismologists didn't entirely understand the physics of earthquakes - something that was necessary to predict quakes. "If you make enough predictions, eventually you're going to get lucky," he said. Hyde said these men's theories should not be discounted at face value - maybe someone will get it right one day. "You've got to be open-minded but you've got to be careful it's not so open your brain falls out," she said.